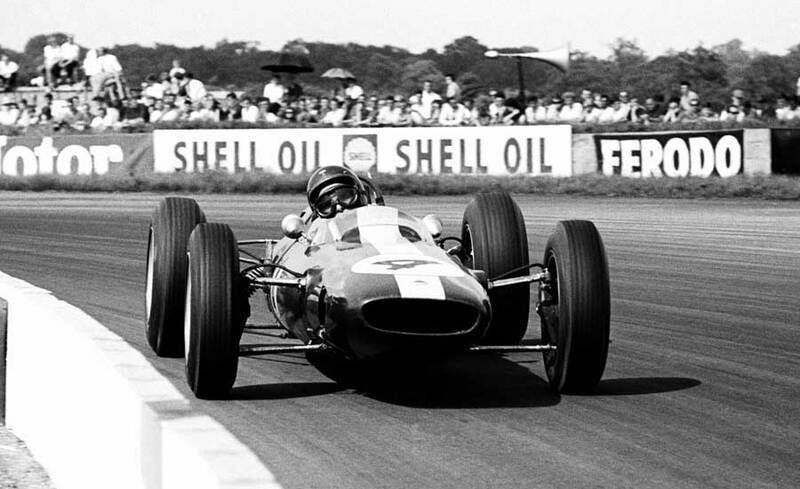 The British Grand Prix returned to its spiritual home of Silverstone after a three year absence, and on a hot and sunny July day Jim Clark drove supremely confidently to take victory in his Lotus 25, his fourth successive grand prix win. Although he started on pole, Clark did not have it all his own way at the beginning of the race. In the opening handful of laps he found himself down in fifth as Jack Brabham roared off into an early lead with Dan Gurney just behind him. But it took only four laps before Clark swept into the lead and, once there, he wasn't going to let anyone catch him. On lap 27, Brabham retired with a broken valve spring leaving Graham Hill and John Surtees locked in a 100mph battle for third - every time Surtees nosed his Ferrari in front, Hill would sit in his slipstream down the straights and swing back ahead of him a lap later. Gurney eventually dropped out on the 59th lap with engine failure and Hill, having won the tussle with Surtees, set off after Clark, who was 50 seconds ahead of him. Hill started flying around the track and, with only six laps to go, had reduced the gap to 36 seconds. As Clark took the chequered flag, Hill started losing speed when his BRM began to run out of fuel on the final lap. He just managed to free-wheel across the line, but Surtees took his chance and snatched second place just ahead of the frustrated Hill. It was another convincing performance from Clark, who now had 36 points in the championship, with Hill a distant second on 17 points.